UP Board Practical Date Sheet 2018 is Available for Both 10th, 12th Exam. From 15 December in 23 District which are connected to Madhyamik Shiksha Parishad will conduct Practical exam in their respective school. UP Board practical Exam last date to be held 13 January 2018. Interested candidates must read below notification. 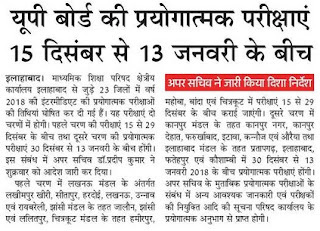 UP Board 12th Practical Date 2018: Latest News 4.12.2017 From 15 December to 13 January Intermediate practical exam held in two phases. Practical exam in UP Board is very important because 30 percent marks added in Mark sheet of UP Board. Mostly Students belongs to Art, Science, Math’s and Biology Students have submit practical file. We will also update the UP Board Practical Syllabus subject wise. To know more update and UP Board Practical Exam Date check below. Name of The Posts: UP Board Practical Exam Scheduled. Board Name: Madhyamik Shiksha Parishad. Class: Intermediate and High School. UP Board Practical 2nd Phase of Practical: 30 December to 13 January 2018. Allahabad Mandal:- Pratapgarh, Allahabad and Kaushambi. Note: we will soon update the UP Board High school practical date if published in a week.